The Darien Library is proud to announce that we have two new products that may be of interest to you. The first is Gale courses. These courses are offered online and you can take them for free when you use your Library card. They are 6 week personal and professional development courses led by expert instructors. New courses begin every month. 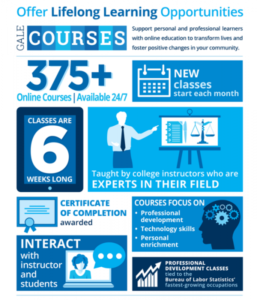 You can access Gale Courses from our library’s website: www.darien.lib.wi.us. Enroll for free! Courses are offered in these areas and many others: Accounting, Business, Computer Applications, Design and Composition, Law and Legal Classes, Writing and publishing. The second product is Lynda.com which offers over 12,000 expert led, online courses and video tutorials. You can access these courses through our library’s website: www.darien.lib.wi.us. Lynda.com offers 35 plus new courses each week! A wide variety of courses are offered including Photography, Marketing, Web Cad Design, and various other computer classes.